Johnny Reed plays and sings everything on this 3rd Pop/Rock release. Johnny has channeled the Greats of Classic Rock into a fresh new Pop album of story songs about relationships, social issues and Life. 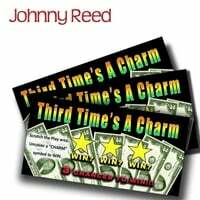 “Third Time’s a Charm” is Johnny Reed’s 5th album release. Johnny channels the Classic Rock feel of the greats like, Paul McCartney, Crosby Stills & Nash, Tom Petty, Elton John and the philosophic consciousness of Bob Dyan. As with all Johnny’s previous releases, Johnny wrote all the songs, played all the instruments, sang all the vocals, engineered, and produced everything. Johnny’s first 2 albums were Hard Rock as front man for his delusional group, “RAWK DAWG”. On “Third Time’s a Charm”, Johnny stretches his musical wings further, and flies through relationships, social issues and Life. The project was recorded throughout 2015 in THE MUSIC ROOM ® Studio in Redondo Beach.